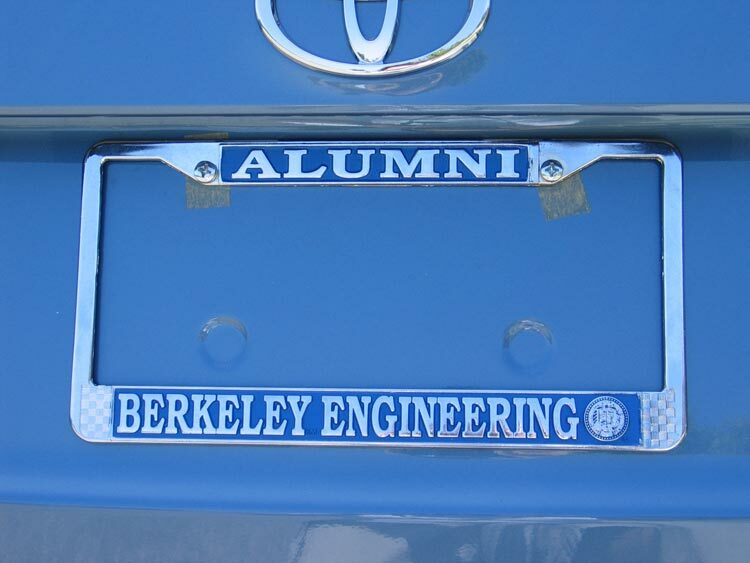 One of my post-crash sources of peevishness (far out of proportion, given everything else that happened, but nonetheless) was the fact that my Berkeley alumni license plate frame was twisted and bent beyond repair. However, serendipity saves the day — before the crash, I'd made a donation to Berkeley's College of Engineering, and a thank-you gift of a shiny (metal!) 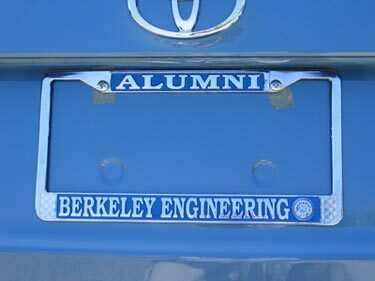 Berkeley Engineering alumni license plate frame was already on its way to me. The perfect geek accessory for the perfect geek car! So obviously, our insurance company came through for us — not only did they make us whole, we came away with a bit extra. 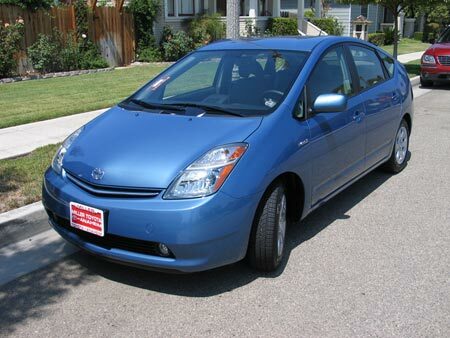 (Plus, '07 Priuses are cheaper; not only was the base price lower, but now that the hubbub has died down, dealers will go below MSRP.) On top of that, my brother and I even got unexpected $750 checks for 'pain and suffering'; mine is going to pay for shore excursions on the Alaska cruise that Shelby and I are taking next month. Thanks to the insurance company, we got a copy of the police report. The most interesting "I didn't know that" fact provided by the report is that there was a fourth car in the accident that we weren't even aware of! When I got out of my car after the accident, I saw a second car parked down the road, behind the wagon that had hit me; since I couldn't see any damage from that distance, I assumed that they were just good Samaritans who'd stopped to see if wagon-guy was OK. It turns out that my car had been pushed into that second car, either rear-ending it directly as a result of the first hit, or obliquely after I collided with the truck in the adjacent carpool lane. Since I was more into paying attention and maintaining safe distances than wagon-guy, the owner of mystery car was able to drive it away from the scene (according to the report, it "sustained moderate damage to the rear bumper"); that makes me feel a little better about the whole thing. ... but not before we use it this weekend to pick up new kitchen countertops from IKEA! (No, it's not particleboard-and-laminate stuff for us; mysteriously, IKEA has great prices on large expanses of solid oak butcherblock.) 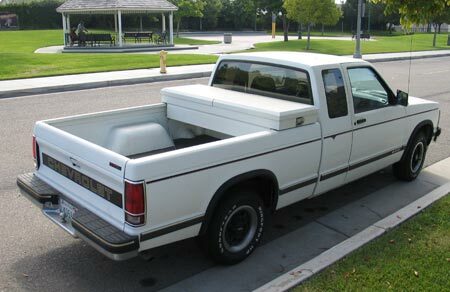 Thanks to the generosity and indulgence of my grandparents, I've been driving around in my grandfather's 1991 Chevy S-10 pickup truck. It makes a great truck (you can tell it was made to be a real truck and not a fashion accessory, because the suspension is very bouncy when there's nothing in back to weigh it down), but I'm ready to go back to a cushy car with a navigation system, a stereo system I can plug my iPod into, a handsfree Bluetooth phone hookup, and fuel economy. I thought I was doing pretty good when it took me quite a while to use up my first tank of gas in the truck ... and that's when I found out that the truck had a twenty-gallon tank. ... I'd had a number of people ask me if I'd been hit by an illegal immigrant (for it's an article of faith to many that illegals live for nothing more than illegally driving our roads in poorly-maintained death machines), but it turns out that my guy was a living example of a different Southern California stereotype: that of your 'typical' Inland Empire resident. Even with all of today's problems, there just seems to be something so right with a world where an eight-foot-tall Lego man can mysteriously wash up on a beach in the Netherlands. ... it's funny-yet-true: when I went off to my freshman year at Berkeley, one of the books I took along was the LISP 1.5 manual that my dad bought when he was a CS student at UC Irvine. It didn't do much to help me -- unsurprisingly, some things had changed between LISP 1.5 and the Scheme dialect of Lisp that I was using thirty-one years later -- but it provided a reassuring sense of continuity. Some small part of me hopes that someday my daughter will be a programming geek, and that she can cut her serious-coding teeth on a dialect of Lisp, too.